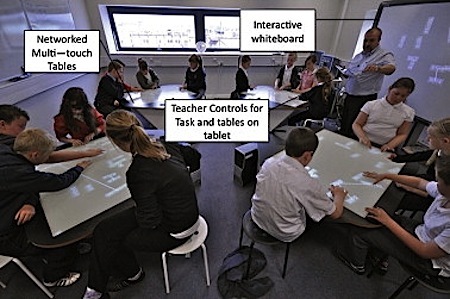 A just-concluded study compares the use of interactive "smart" desks with conventional paper-based approaches to see if this technology should be tried in open classrooms. "Our aim was to encourage far higher levels of active student engagement, where knowledge is obtained by sharing, problem-solving and creating, rather than by passive listening," said Liz Burd of Britain's Durham University, who led the study. The three-year project worked with 400 eight to ten-year olds; the results were recently published in the journal Learning and Instruction. The research team, whose findings were published in the journal Learning and Instruction, designed software and desks that recognise multiple touches on a desktop using infrared light vision systems. The desks are built into furniture of the classroom to help encourage more collaboration, and are networked and linked to a main smartboard. A live feed of the desks goes directly to the teacher who can intervene quickly to help a pupil while allowing group work to continue. Burd's team found that 45 percent of pupils who used a maths programme on the smart desk system increased the number of unique mathematical expressions they created, compared with 16 percent of those doing it on paper. Using the new desks helped children work together and solve problems using inventive solutions, the researchers said. As long as the researchers are following Card, I wonder if they tried to implement something like free play, an interactive computerized environment that encouraged students to try new ideas, and (not incidentally) measure their progress. The Korean government will invest 1 billion KRW ($8.69 million USD) in 2011 to expand the system to 500 preschools. Eve's Final Fantasy-like facade hides the real engineering; it's designed to be a one-to-one system. With an array of motors in her head that stretch the soft synthetic skin into various positions, Saya can display emotions. From Collaborative learning with multi-touch technology: Developing adaptive expertise (abstract only) via Reuters.